As I throw the last bale of hay in the training barn and close the doors on this training cycle, I would like to thank you. Saying thanks to you is not something that should be taken lightly or in jest either. You see, training plan, you were something that I have long gone without in my running life. My style has been pretty free flowing for years on end. I would pick a race or goal, look at what others have done, and cobble something together in my mind that I would loosely follow. Yes, it has taken me to places that I had only dreamed about until achieved, but others have long extolled the virtures of you. Others spoke of you delivering them to the starting line, confident they have done in practice what was necessary to achieve their goal on race day. Despite their admiration for you, I admit to being hesitant to allow you to be part of my life. You would force me to put fences around my running. You would force me to count back from race day and actually have a purpose to each run. No more just going out and doing whatever I felt like. So tentatively, I began following your words and workouts. Was I hoping in the back of my mind, you wouldn't deliver and I could return to my free spirited, unstructured ways? Most certainly. Slowly though, you began to win me over. Despite some detours on the road, namely injury and sickness, a perfect opportunitiy and or excuse to throw you away, I stuck with it. My legs and lungs begn to respond to the specific workouts and an attitude of, "well, maybe this isn't so bad" began to gain momentum. I began to understand the value of what others had whispered on training runs or in races. As I toe the line of another marathon this weekend, I will be doing it having followed a plan. This is a huge step for me, and I have you to thank training plan. I can't quite remember how you came up with your name. Was it decided like my sister's in the hospital over a game of cribbage? Or did your parents, play rock, paper, scissors and the winner got to choose? In either event, you were different from the beginning. Instead of running with your friends, fartlek, tempo and LSD out on the playgrounds, you decided it was better to chill. "Come and play, with us" , they shouted and you thought them fools to expend all their energy. You were like a squirrel storing nuts for the winter. You were storing energy for that BHAG (big hairy audacious goal) or "A" race. The craft you stated, was that if you followed me, cutting back on mileage, but not necessarily intensity, and allowing the body to rest and rebuild, you, the runner, would be at your best you said. That climb up the mountain to achieve your BHAG or "A" race although still difficult, would not be as perilous. However, maybe it was like the story that gets told to one person, but by the time it gets to the 10th, the intent and originality is skewed and nowhere near the original meaning. This is what I believe has happened to you, Taper. Somewhere, somehow your ideas got misinterpreted and a whole sub culture began a rapid ascent to the top. Instead of enjoying and savoring that which is you and part of the process, people began freaking out. They mistook the decrease in mileage as a sign that they were losing fitness. They looked at the extra time on their hands from not training and began letting thoughts of self doubt, "Why didn't I hit this workout as hard? " and "Am I really ready?" creep in. They begin avoiding everyone and everything fearing sickness or injury. I know this was not your intent, and I too admit to in the past to falling into this trap. But, no longer will this be. I have come to understand Taper, that you have a purpose. There is a craft to your "madness". Like any journey, there will be peaks and valleys. At the peak of our training, we must allow a little bit of a slide into the valley before the push up to the top. The slide, yes you Taper, allows us to build momentum necessary to make it to the top and achieve our BHAG . You are not something to fear or freak out about, but rather something to embrace. Someone once said, "with great power, comes great responsibility." So Taper, I hope you find time to reflect as you sit on the sideline watching speed work, intervals, and the others run about and seek to restore your true intent. As a family on the go, it is easy to get be in such a hurry that convenience over a healthier option makes it's way to the dinner table. With both the wife and I in the midst of marathon training, we have made a much more conscious effort to provide healthier and more nutritious options for the family. Enter, Time for Dinner, Strategies, Inspiration, and Recipes for Family Meals Every Night of the Week. One of the things my wife and I like about the book besides the fact that the meals are really easy to put together (note: 30 min meals on the Food Network, really take more than 30 minutes to make), is that there is almost an option for each person to customize each meal. 3. In a blender, mix the dressing with the peanut butter. 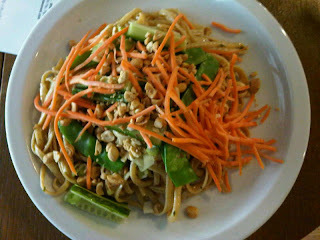 Toss the noodles with the peanut sauce, or pour it into it's own individual bowl. 4. Serve everyone a bowl of noodles and have them customize their own meals.